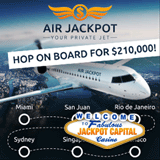 Travel with Jackpot Capital Casino to some of the world's most exotic destinations this summer during the $210,000 Air Jackpot casino bonus event. A total of $180,000 will be paid to frequent players whose names are listed on the scoreboard and another $30,000 will be awarded in random draws. And here's some great news for top scoring players: maximum weekly Scoreboard bonuses have increased from $500 to $800! Miami, San Juan, Rio, Sydney, Singapore, Monaco… at each destination during the Air Jackpot event, you'll find fun facts -- and special bonuses. Every Monday you cando “online check-in” for your upcoming flight (by using the special bonus offer) and be able to enjoy the full package of excitement. Jackpot Capital players earn points when they play in the online casino or in the mobile casino. Every Monday 300 top scoring players will get weekly bonuses up to $800. $30,000 in bonuses will be awarded to top players every week until August 28th. As well, all active players qualify for random bonuses awarded every Friday – another $5000 in coupons will be delivered by email every week, just in time to help players qualify for bigger bonuses on Monday. Check your current scoreboard ranking anytime at http://promotions.jackpotcapital.eu/airjackpot where contest details are also available. Jackpot Capital Casino, known all over the world for its excellent customer service, offers hundreds of games from Realtime Gaming. The most popular games are also in its mobile casino.